Pattern, a year-old, Redwood City, Ca.- based startup, wants to become a kind of external brain that lightens the load of managing customer relationships for salespeople. Felicis Ventures, SoftTech VC, and First Round Capital have just furnished the company with $2.5 million in seed funding toward that end, too. You can kind of see why, given the problem Pattern is trying to tackle. According to founders Derek Draper, Zack Moy, and Josh Valdez — all ex-Googlers — a salesperson’s book of business produces more than 5,000 “signals” in any given month, creating information overload. The tools that many use can exacerbate the problem, too. Think email, calendar, spreadsheets, to-do lists, their CRM system, their phone. Draper, Moy, and Valdez, who are currently running the company with five other former colleagues from Google, say they were long ago inspired to fix the problem. In fact, Draper and Valdez met at Wildfire, a social media marketing company that sold to Google in 2012. They say that there, they invested more heavily in sales operations than do most companies, including coming up with fresh tech to help Wildfire’s sales team use their time more efficiently. Though creating new technology wasn’t their full time job at Wildfire or at Google, it is now, and the online “workspace” that they’ve created seems interesting. For example, a salesperson can inject notes into a particular field on the platform that will prime what questions she or he should ask a potential customer — after which the salesperson can easily set a reminder to follow up with that person or company. 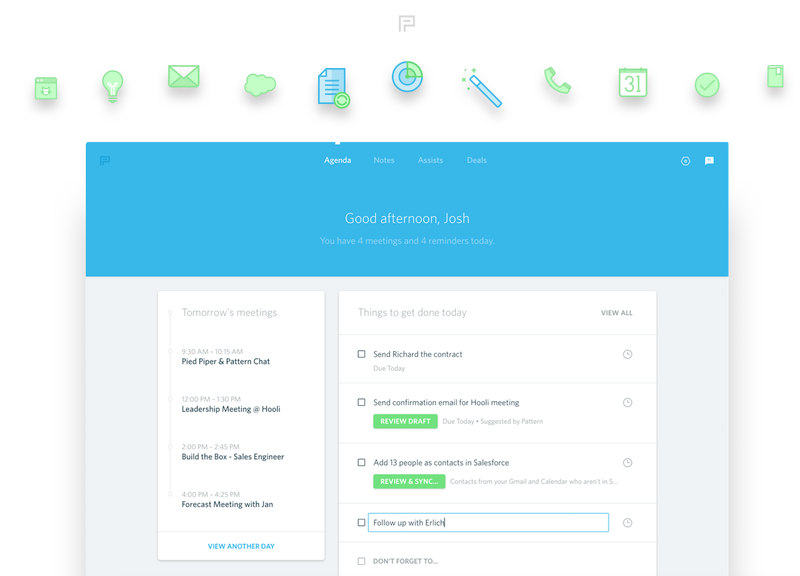 Pattern’s productivity suite also provides prompts that make following up with a contact easy. Using a salesperson’s contact list and other archived information, it will essentially create thank-you notes that can be fired off with the click off a tab. It will automatically confirm meetings ahead of time. Using some machine learning, it will also suggest to salespeople when they should be following up with a certain contact if it’s not already in their calendar to do so. Not last, Pattern will notice when people who you are working with don’t exist in Salesforce and whether you’d like to invite them, a feature that management seems to like particularly, says Draper. Of course, Pattern isn’t the only company trying to make salespeople more efficient and to prevent them from dropping the ball. At least 300 startups are trying to tackle some form of sales productivity. For those who may be interested in learning more, the company is allowing access to the platform on a first-come, first-served basis. It’s offering the first 100 TechCrunch readers who sign up priority access, too. Click here for more information.